I've had the Barry M Crackle effects nail polish for a while and after shopping in Superdrug and purchasing the Croc Effect Nail polish, I thought I would do a blog posting about them all. I love all of Barry M nail polishes, and of the 5 i have used here, i love the croc effect the best and the blue crackle effect. 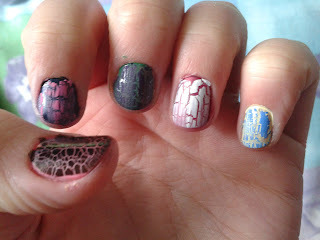 Has anyone else tried the croc effect and crackle effects nail polish?